Nintendo is expected to have a larger share of the console market than Microsoft this year as the Switch continues to perform well. 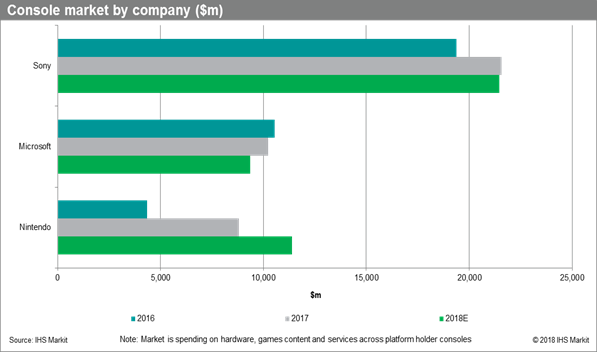 Analysis from IHS Markit reveals that over $10 billion was spent globally on Xbox hardware, software and services in 2017, while spending on Nintendo products was around $8 billion. This is approximately double what the Japanese firm achieved in 2016, while Microsoft actually saw a slight year-on-year dip. Nintendo's growth was predominantly driven by the launch of Switch, but also the release of the SNES Classic and continued sales of the 3DS. Looking ahead, IHS Markit predicts spending on Nintendo products and services to be over $11 billion in 2018, while Microsoft is expected to dip to around $9 billion. In fact, growth for Nintendo is expected detract from spending on both Xbox and PlayStation, especially as those two consoles enter the later stage of their lifecycle. However, PlayStation will almost certainly hold its position as market leader. Spending on PlayStation products and services rose to well over $20 billion in 2017. While it is expected to dip slightly this year, it will still remain past that milestone. The console market is expected to grow by four per cent in 2018, with spending on hardware, software and services forecast to reach $42 billion. In 2017, global spending amounted to $41 billion - up from around $35 billion in 2016. This not only stopped the two-year decline that began in 2014, it also represents the biggest growth in spending since 2011. However, IHS Markit notes that we've yet to match the peak market value of $56 billion recorded in 2008, at the height of the Wii's success. Hardware revenues were up by 33 per cent in 2017 to $14.1 billion, thanks to the launch of Nintendo Switch, Xbox One X and continuing sales of PS4 Pro. IHS Markit reports 12.8 million Switch units were sold over the course of the year. Software - encompassing digital and boxed - generated $23.6 billion, up by 12 per cent year-on-year. Subscriptions to Xbox Live and PlayStation Plus grew 11 per cent to $3 billion. This is expected to grow dramatically in 2018 when Nintendo launches its own online service.